Georgia sent four delegates to the Constitutional Convention in Philadelphia in 1787. They were: Abraham Baldwin, William Few, William Houston, and William Leigh Pierce. Abraham Baldwin was born in Guildford, Connecticut in 1754. His father went deeply in debt to educate his children. Baldwin was educated in a village school growing up and then he was accepted to Yale in New Haven. He served as a chaplain for the Continental Army during the war. It was after the war that he realized he wanted to pursue his interest in law and politics. In 1783, he moved to Georgia and was granted permission by the legislature to practice law. In 1787, Baldwin made the journey to Philadelphia to the Constitutional Convention. He mainly focused on resolving the disputes between the small and large states. At first he supported Senate representation by population and property holdings, but he eventually changed his mind and sided with the small states, possibly because of his Connecticut roots. William Few was born in 1748, in Baltimore, Maryland. Few and his family lived in near-poverty and his father decided that they could purse a better life if they moved to North Carolina, which they did in 1758. In 1771, Few, his father, and his brother joined the “Regulators”. The Regulators were a group of yeomen who disapproved of the royal governor. The brother was hanged and Few’s family was forced to relocate to Georgia. Although Few was a self-educated man, he proved to be a natural leader and was elected to Georgia’s congress during the war. He was absent for a great deal of the Constitutional Convention, but he always voted in favor of the nationalists. He also attended the state ratification convention and was one of elected as one of Georgia’s first senators in 1789. William Houston was born in to politics in Savannah, Georgia, in 1755. His father, Sir Patrick Houston, served on the council of Georgia’s royal government. Houston was educated in law at Inner Temple in London. However, he had to return early because of the war. His family, coming from the upper class, remained loyalists, while Houston was a fervent advocate for the colonists. Houston served Georgia during the Continental Congress where he was tasked with handling a boundary issue with South Carolina. At the Constitutional Convention, Houston favored the large states and voted against equal representation in the Senate. This further divided Georgia’s delegates. William Leigh Pierce was born in Georgia in 1740, but he grew up in Virginia. He served under General Nathanael Greene during the Revolution and he received a ceremonial sword for his service at the Battle of Eutaw Springs. When Pierce left the army, he made his home in Savannah. He started an import-export company called Pierce, White, and Call, which fell through after a year. He tried again in 1786 and created William Pierce & Company. Although Pierce did not have a political background, he did favor a stronger central government as long as the states retained some of their individual powers. He fully approved of the Constitution. In the 1780’s, $1,000 dollars worth of Georgian paper currency was only worth $1 in specie. 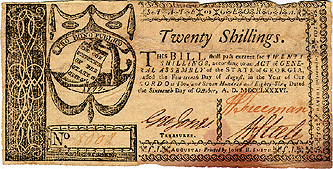 This was until November 13, 1786, when all paper money was considered unredeemable. Georgian currency had the phrase “Pro bono publico”, meaning “For the good of the public”, printed on it, which came from their state constitution. They printed bills in denominations of 6 dollars, 1 shilling, 6 dollars and 2 shillings, 5 shillings, 10 shillings, and 20 shillings. The three higher denominations required three government signatures, and the lower three only required two.